A long shot? Inslee pointed to the funeral for former President George H.W. Bush, noting that two former presidents in the front pew, Jimmy Carter and Bill Clinton, were once "pretty much unknown governors of small states." Gov. Jay Inslee’s fledgling federal political-action committee on Thursday reported $112,500 in donations as he inched closer in an interview toward declaring a possible run for president in 2020. The governor’s Vision PAC reported about two dozen early contributors, including wealthy environmentalists and tech executives, in a filing with the Federal Election Commission. The cash will enable Inslee to explore his presidential viability and could pay for travel to early caucus and primary states including Iowa and New Hampshire. In an interview with The Seattle Times and public radio’s Northwest News Network, Inslee stressed he has yet to make up his mind, but said he is “actively considering” a White House run – and made an argument for his viability as a candidate who’d make 2020 a referendum on fighting climate change. The two-term Democratic governor would almost certainly start out as a long shot for his party’s nomination amid a thicket of better-known potential contenders, including Sens. Bernie Sanders of Vermont and Kamala Harris of California, and former Vice President Joe Biden. But Inslee pointed to Wednesday’s funeral for former President George H.W. Bush, noting two former presidents who sat in the front pew, Jimmy Carter and Bill Clinton, “were pretty much unknown governors of small states” before they ran for president. Inslee boasted of what he called “the Washington Way,” citing the state’s economic growth while raising wages and worker protections as a template for the nation. On his central issue, the governor and his climate-activist allies have endured a rough couple of months. Washington voters in November rejected a carbon-fee initiative he promoted. France delayed fuel-tax increases after violent protests there. And scientists issued reports saying the impacts of global warming will be even more devastating than previously thought. Inslee said retreat is not an option. He recently visited the scene of devastating fires in Paradise, California, comparing the scene to a World War II firebombing. “We have to act now. There is no acting tomorrow. This is a today emergency, if you will. And it’s doubly so because we have a climate denier in the White House who is intent on ignoring hundreds of national scientists,” he said. In a statement Thursday, state Republican Party Chairman Caleb Heimlich criticized Inslee’s record, saying he “has no signature accomplishments.” He cited a loss of federal funding for the state’s largest psychiatric hospital, growing homelessness and traffic. “He’s a talker who is more focused on public posturing than fixing the problems that he and fellow Democrats have caused here in Washington State,” Heimlich said. Next week, Inslee will roll out new climate-action plans as part of his proposed 2019-21 state budget, saying increased Democratic majorities give his ideas a better chance than in past years, when the Legislature has refused to advance measures including a cap-and-trade plan to cut greenhouse-gas emissions. Although carbon taxes may not be a part of his soon-to-be announced proposal, Inslee said there are multiple approaches that can make a difference. Some environmentalists have called for requiring solar panels in new houses and phasing out fossil fuels for electricity. “There is no silver bullet, there is, you know, golden buckshot, because it’s going to take a lot of different kinds of policies to win this battle,” Inslee said. Inslee has moved gradually toward a potential presidential run over the past year, in part through making connections and raising his visibility as chair of the Democratic Governors Association. As that role wound down, with his term officially ending last week, Inslee has shifted more explicitly toward his own 2020 ambitions. The establishment of his federal PAC in early October was among the most concrete signs to date of his intentions. Inslee’s early PAC donations include support from longtime environmentalist donors, including Martha Wyckoff, a longtime board member with the Trust for Public Land, who gave the maximum allowed $5,000. Amazon’s general counsel, David Zapolsky, also gave $5,000. Travel guru Rick Steves donated $2,500. Vision PAC also reported paying three longtime Inslee campaign consultants for their work. Thursday’s FEC filing for Vision PAC covered the period between mid-October and Nov. 26. While boosting his profile, the governor’s increasing out-of-state travel has strained the taxpayer-funded budget of his state patrol security detail, which is seeking a $1.3 million budget over the next two years as it predicts Inslee’s trips will increase. Those expenses have drawn criticism. Four Republican state representatives proposed legislation this week seeking to stop taxpayer funding for such political trips by setting up a new fund for private donations to cover security costs. The bill, whose chief sponsor is Rep. Jim Walsh, R-Aberdeen, says “extra travel not related to state business and at the governor’s discretion should not be borne by the taxpayers of Washington state.” With Inslee wielding a veto pen and Democrats controlling the state House and Senate, it’s not likely to pass. There are other signs Inslee has his eyes on a national race. He said he hopes to speak with former President Barack Obama, as other 2020 hopefuls have done. And with a potential need to brush up on foreign policy, he also met earlier this year with Ben Rhodes, Obama’s deputy national-security adviser. Last week, Inslee traveled to San Francisco, with details of the trip kept quiet by his political team. 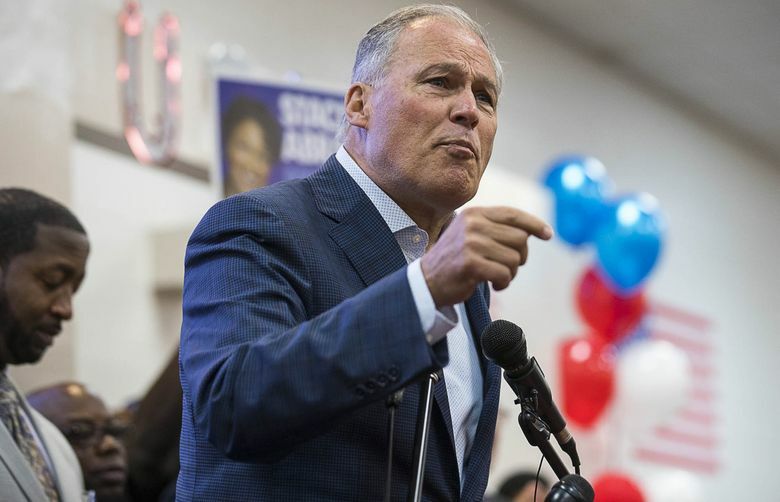 In the Wednesday interview, Inslee said that trip included a “good discussion” with billionaire Tom Steyer, who has been an ally on climate change but who also has made moves toward his own presidential bid. Inslee could use wealthy allies like Steyer if he takes the plunge. Leaving aside potential big fundraisers like Sanders or Texas Rep. Beto O’Rourke, even another western state governor, Colorado’s John Hickenlooper, is ahead of Inslee in an exploratory effort. Hickenlooper’s Giddy Up PAC, formed in September, already has raised $370,000, according to a new FEC filing. Although Inslee’s name isn’t typically on lists of top 2020 candidates, he attracted some national media attention this week by publicly targeting a fellow Democrat, West Virginia Sen. Joe Manchin. Inslee posted a petition online demanding Senate Democrats block Manchin, a coal-state politician, from becoming ranking member of the Senate Energy and Natural Resources Committee. “He supports Donald Trump’s dirty energy agenda,” Inslee’s petition said. Manchin’s elevation on the Energy Committee could occur if Washington Sen. Maria Cantwell, who would be next in line for the spot, instead accepts the ranking position on the Senate Commerce Committee. Inslee said he traded phone calls with Cantwell about the issue, but they had not connected. With Inslee’s plans up in the air, he confirmed an earlier statement to The Hill saying he’d make a decision by April. Inslee’s also not ruling out running for a third term as governor. He could test the presidential waters and withdraw if he fails to gain traction in early primary states, and still file to run again for governor by the May 2020 filing deadline. “I see no reason to take that off as an option,” he said.